Pictures today are from Pinterest, for those who don't get to access that site. If you want to see my Pinteresr collection, go the side bar and the left, where it says "please join me on Pinterest." Here at home when someone is sick, I like to scurry around making things comfortable and preparing a tray of comfort foods or whatever their cravings are. When I don't feel well, it is so nice that my husband brings me a tray, or if he can't find one, simply uses a large dinner plate and puts a tea cup on it and some crackers and an assortment of herbal tea sachets. 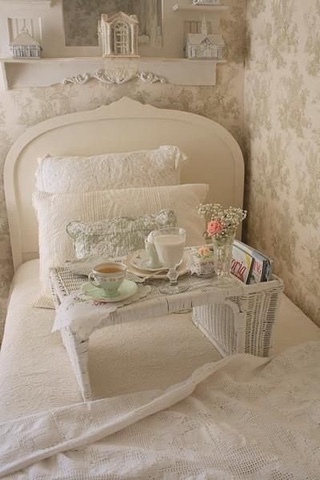 I think the vintage wicker bed trays are very elegant and picturesque, but even the shallow cardboard box lined with a dish towel and laden with an old tea cup was so special to us when we weren't feeling well. Making a sick person comfortable is a good skill to learn. 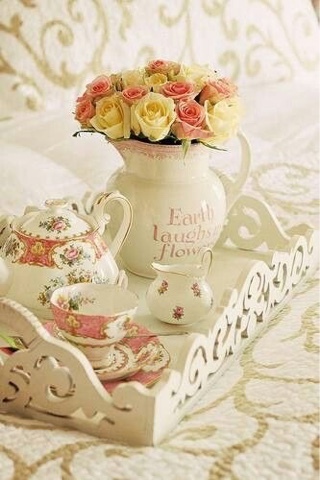 When my children were growing up, I sometimes took them a tea tray to their room just for a treat. I always told my children, when they were sick, to give into the sickness, don’t fight it. That way they could relax and not worry about what they were missing. Yes!Laet it run its course. Rest, rest. Recover slowly. What a perfect post! We are all sick at our house right now. Thankfully, I am the least sick and can still make tea trays for us all. What a nice way to brighten our day. Our toddler is even getting weak tea with honey to help his sore throat. He loves it! Thank you for the great post! What a great post! Thank you! 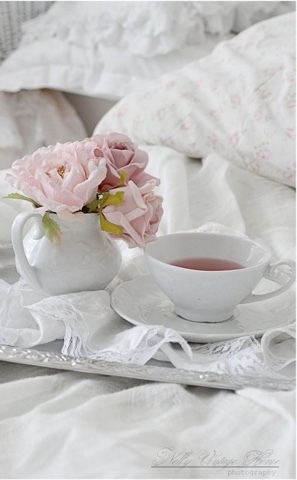 We are all down with colds at our house, and tea trays sound like just the thing. Even our toddler will take cooled weak tea with honey. I think we will be on the mend soon thanks to some "teaLC".